Source: U.S. Energy Information Administration forms EIA-923, Power Plant Operations Report, and EIA-860, Annual Electric Generator Report. Note: All data are preliminary and subject to revision. Final data will be published later this fall. 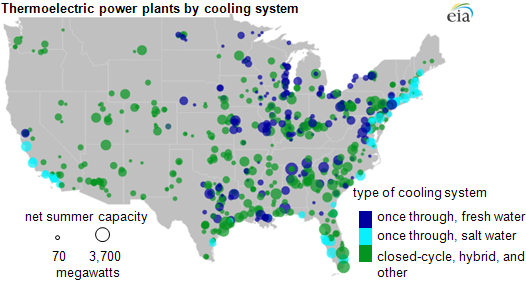 Only power plants that reported operational cooling systems that withdrew water for cooling in 2011 are displayed. Cooling systems are aggregated to the plant level. Prolonged drought can affect power plants that rely on large volumes of fresh water for a variety of reasons. Though there have been few reported problems this year, lower water levels are a potential concern for grid operators and system planners during periods of extended drought. The map above shows the relative size of electric power plants, expressed in megawatts, for the subset of power plants that reported operating cooling systems, by type, that withdrew water for cooling during 2011 (the latest full summer season of data available). Once-through, fresh water cooling systems are more likely to be affected by lower water levels in lakes, rivers, and streams that occur in sustained drought periods. Once-through, salt water cooling systems withdraw and discharge from larger bodies of water (oceans, bays and sounds) which are slightly less likely to be affected by lower water levels in sustained drought periods, though they can be affected by temperature regulations. Closed-cycle, hybrid and other systems either reuse water after withdraw or use very little water for cooling. Over half of the cooling systems at U.S. power plants re-use water through a cooling tower, though some of the larger plants in the nation have once-through systems from fresh water sources. Dry-air cooled systems use essentially no water for cooling purposes but are not in wide use at this time. Thermoelectric power plants use water to cool down (condense) steam after it has been used to turn a steam turbine to generate power. For once-through cooling systems fed by fresh water sources, the need to withdraw significant amounts of water makes these plants more vulnerable to deratings or outages when water levels drop or water temperatures rise. When water levels fall significantly, water intake structures may be exposed above the water surface, causing the plant to become nonoperational. Additionally, at higher water temperatures, generators are less efficient, reducing the power capability of the plant. Again, no major system effects have been reported so far this year due to drought. Some areas also place regulatory limits on the temperature of the water a cooling system discharges. At times of excessive heat, power plants are not allowed to raise water temperatures past levels safe for species of fish and other aquatic life. A lack of adequate water flow can also limit the use of hydroelectric power due to reduced reservoir levels and stream flow. In areas with high reliance on hydroelectric capacity, low water conditions can affect electric reliability.